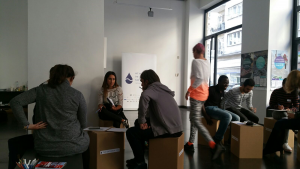 What a great co-creation Hackathon! Everyone sat together for hours and hours, we got creative and in between – we admit it – also a little desperate BUT in the end it was all worth it. Our Hackathon put great minds together and we were able to come up with great proposals. 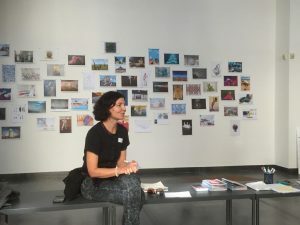 The event took place at the HybridArt Space on October 4th and was part of the still ongoing Art Moments – The Universal Sea Budapest Festival (So check out all the other great exhibitions, workshops and interactions there!). It was moderated by Nicole Loeser, our creative lead and was dealing with questions of how we can engage the public to act against the plastic epedemic. 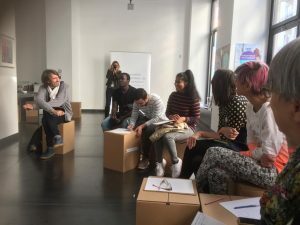 The participants came from different backgrounds and included artists, change leaders, entrepreneurs and thought leaders as well as our core partners and artists in residence. We talked about our fears of facing undrinkable water quality and what that might mean for our future generations. How would those disadvantaged in our society be affected if clean water became a commodity? Would there be widespread onset of diseases? What would happen to our environment and wildlife? Would the fight for water eventually lead to war? 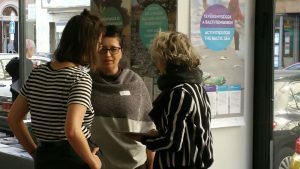 In the fight against plastic water pollution the group discussed who we need to involve and inspire to become part of the solution, with key audiences identified as: children & students, politicians, influencers, consumers, manufacturers. We then workshopped ways in which to get these essential demographics on our side and inspiring others. The group also discussed things such as daily interventions or routines to raise awareness of personal plastic use, how we can build a narrative to engage people in the plastic epidemic fights, and how we might form a collective identity as a movement against plastic. We collected some great ideas and gained new energy to continue our fight for plastic free oceans! !